Born in Atlanta, Georgia on March 17, 1902, Bobby Jones battled health issues as a young boy, and golf was prescribed to strengthen him. Encouraged by his father, Jones loved golf from the start. A formidable prodigy, Bobby Jones won his first tournament at age six. His first championship was the 1916 U.S. Amateur, where as a 14-year-old he advanced to the third round. From the beginning, Bobby Jones' swing possessed "a drowsy beauty," in the words of British Amateur golfer and World Golf Hall of Fame writer Bernard Darwin. He won the Southern Amateur three times in 1917, 1920, and 1922. Jones qualified for his first U.S. Open at age 18 in 1920, and was paired with the legendary Harry Vardon for the first two rounds. Bobby Jones had to dominate a fiery temper that hindered him as a youth. As talented as he was, he did not win his first championship until 1923, prompting the early part of his career to be labeled "The Seven Lean Years." But Bobby Jones had a revelation when he discovered that the key to winning was learning to score well when playing badly. "I think this is what I learned to do best of all," he wrote, and "The Seven Fat Years" ensued. From 1923 to 1929, amateur golfer Bobby Jones dominated both the British and American golf landscape. He was "an ultra-athlete," according to writer and historian Charles Price, "recognized at being better at his game than any other athlete was at his." While there is no doubt Bobby Jones is the finest amateur golfer the game has ever produced, there's a strong argument that he was the greatest golfer, period. Bobby Jones was national champion eight years in a row, won four U.S. Open Championships (tied for most all-time), and three of the four British Open Championships in which he competed. Representing the United States in international Walker Cup competition, Bobby Jones was undefeated in singles, and 9-1 overall on five undefeated American teams, serving as playing captain of the U.S. team in 1928 and 1930. Beginning with his victory in the 1923 U.S. Open at Inwood and ending with his U.S. Amateur victory at Merion in 1930, Bobby Jones won 13 major championships in 20 tries, the most imposing run of major titles the game has ever seen. Bobby Jones was the first player to win "The Double", both the United States and British Open Championships in the same year, in 1926. He was the second, and last, to win the U.S. Open and U.S. Amateur in the same year, in 1930, first accomplished in 1916 by Chick Evans. In 1930, Bobby Jones won all four “major” championships, a "Grand Slam" feat that has since not and may never be equaled. He bet on himself achieving this extraordinary feat with British bookmakers early in 1930, before the first tournament of the Slam, at odds of 50–1, and collected over $60,000 when he did it. In his era, Bobby Jones was one of the five giants of American sport, with Babe Ruth in baseball, Jack Dempsey in boxing, Red Grange in football and Bill Tilden in tennis. Bobby Jones was a national hero, the only sports figure twice honored with New York City ticker-tape parades on Fifth Avenue, was twice commemorated with United States Postage stamps, and appeared on the cover of Time Magazine. Bobby Jones retired from competitive golf that Grand Slam year of 1930, at age 28. Explaining his decision, Jones said, "It (championship golf) is something like a cage. First you are expected to get into it and then you are expected to stay there. But of course, nobody can stay there." The New York Times in an editorial upon Bobby Jones' retirement, noted of the occasion, "With dignity, he quit the scene on which he nothing common did, or mean." Bobby Jones accomplished all this while playing competitive golf no more than three months a year at any point in his life. The rest of the time was dedicated to academics, and later, the law. Bobby Jones earned his B.S. degree in Mechanical Engineering from Georgia Tech in 1922 and played for the varsity golf team, lettering every year. The Georgia Phi chapter house at Georgia Tech is named in his honor. He then earned an A.B. in English Literature from Harvard College in 1924, where he was a member of the Owl Club. In 1926 Bobby Jones entered Emory University School of Law. After only three semesters he withdrew, passed the Georgia bar exam and subsequently joined his father's law firm, Jones, Evins, Moore and Powell, in Atlanta. Bobby Jones was married in 1924 to Mary Rice Malone, whom he met in 1919 while a freshman at Georgia Tech. They had three children, Clara, Robert Tyre III, and Mary Ellen. When he retired from golf at age 28, he concentrated on his Atlanta law practice. That same year, 1930, Bobby Jones was honored with the first James E. Sullivan Award, awarded annually by the Amateur Athletic Union to the most outstanding amateur athlete in the United States. Bobby Jones would go on to become one of the game's most lucid and enlightening writers, and made 18 instructional golf films in Hollywood between 1931 and 1933. In the early 1930s Bobby Jones worked with J. Victor East of A.G. Spalding & Co. to develop the first set of matched steel-shafted clubs. Besides his record and character, Bobby Jones' greatest legacy is Augusta National Golf Club and the Masters Tournament, which he founded in 1934. Jones co-designed the Augusta National course with Alister MacKenzie. The Masters today is one of the four major golf championships that together comprise the modern Grand Slam and perhaps the most prestigious, largely due to its association with Bobby Jones. During World War II, Bobby Jones served as an officer in the U.S. Army Air Forces. In 1943 he attained the rank of major and trained as an intelligence officer, serving in England with the 84th Fighter Wing, Ninth Air Force. Landing in Normandy, June 7, 1944, Bobby Jones spent two months with a front line division as a prisoner of war interrogator, reaching the rank of lieutenant colonel. During the war, Bobby Jones permitted the U.S. Army to graze cattle on the grounds at Augusta National. In 1947, Bobby Jones founded Peachtree Golf Club in Atlanta and co-designed the course with Robert Trent Jones. In 1948, Jones developed syringomyelia, a fluid-filled cavity in his spinal cord causing first pain, then paralysis. Bobby Jones never played golf again and was eventually restricted to a wheelchair until his death in Atlanta on December 18, 1971. To American golfer and World Golf Hall of Fame writer Herbert Warren Wind, "As a young man he was able to stand up to just about the best that life can offer, which isn't easy, and later he stood up with equal grace to just about the worst." "What Jones did was create a model that everyone, consciously or unconsciously, followed," said William Campbell. "It is why we have so many fine people in golf. He showed the world how to do it." As Wind added, "In the opinion of many people, of all the great athletes, Jones came the closest to being what we called a great man." In 1958, Bobby Jones was named a Freeman of the City of St. Andrews, Scotland, becoming only the second American to be so honored, the other being Benjamin Franklin in 1759. Bobby Jones remains one of the most legendary golfers of all time and is still the only player ever to have won four major championships in one calendar year. Bobby Jones is a charter member and founding inductee of the World Golf Hall of Fame. The United States Golf Association award for distinguished sportsmanship is and forever will be the Bob Jones Award. It is Bobby Jones' unprecedented and unparalleled achievements in golf, his place in golf history and continued relevance today, and his unique relationship with the City of Sarasota that we celebrate in the BOBBY JONES INITIATIVE. For three memorable winters in 1925-1927, Bobby Jones enjoyed life as a Sarasotan. Bobby Jones arrived in Sarasota at the request of prominent Atlanta businessman and developer, Perry Adair, who had retained the services of the most respected golf course architect of the time, Donald J. Ross, to design a premier course here with the flavor of Pinehurst #2. To further insure the success of the venture, Mr. Adair recruited his friend, Bobby Jones, as sales manager for the real estate surrounding the club. The "sales team" consisted of top amateur and professional golfers: United States Open, British Open, (3-time) Canadian Open and PGA Championship winner and Hall of Fame member Tommy "The Silver Scot" Armour; U.S. Open, British Open and (twice) PGA Championship victor "Long Jim" Barnes; two-time British PGA Matchplay Champion Archie Compston; 1928 United States Open Champion Johnny "The Gentleman" Farrell; British, French, Spanish and Belgian Open Champion Arnaud Massy. In March 1925, Bobby Jones accompanied golf architect Donald Ross as he walked the property to select the golf course site, and on January 22, 1926, Whitfield Estates Country Club officially opened, with an exhibition match pairing Bobby Jones and Tommy Armour versus Jim Barnes and Johnny Farrell. On January 23, 1926, Bobby Jones teamed again with Tommy Armour in a match against Archie Compston and Arnaud Massey. On February 13, 1926, Bobby Jones and Armour challenged career Grand Slam winner, seven-time major champion and charter Hall of Fame member Gene Sarazen and two-time PGA Championship winner and four-time Canadian Open champion Leo Diegel. On February 28, 1926, the club hosted the legendary “Match of the Century”, 72-holes contested between Bobby Jones, the greatest amateur, and the top professional golfer, “Sir Walter” Hagen, with the first 36 holes played at Jones’ home course, now known as Sara Bay Country Club. And on March 14, 1926, Bobby Jones and Armour defeated Walter "The Haig" Hagen and Gil Nichols. In June 1926 the Sarasota Herald followed Bobby Jones' success in the British Amateur and British Open Tournaments. When Jones became the first American amateur golfer to win The Open, the newspaper claimed "Sarasota's Own Wins Title." As a winter resident of Sarasota, he "brought added honors to the city and to himself when he won the title." Community leaders presented Jones with a 1926 Pierce-Arrow sedan in a ceremony at McAnsh Park in July. Area mayors George B. Wallace of Bradenton, Wilbur E. Mann of Palmetto and Everett J. Bacon of Sarasota "paid homage to Bobby" during the presentation. The City of Sarasota had also wisely commissioned Donald Ross to design its Municipal Golf Course in 1925. Bobby Jones headlined the dedication match for Bobby Jones Municipal Golf Course on February 13, 1927, before a gallery of 1,500 spectators. In the exhibition, paired with Charles Ringling son-in-law and Ringling Bank president Louis Lancaster, Bobby Jones scored two-over-par 73, U.S. Amateur runner-up Watts Gunn, 75, Lancaster, 77 and West Coast Golf League Sarasota team member Jim Senter, 83. In 1982, Bobby Jones Golf Club named its four championship nines after the courses where Jones won his 1930 Grand Slam: the American (Open) Interlachen and (Amateur) Merion and the British (Open) Hoylake and (Amateur) St. Andrews. In 1994, the relationship between Bobby Jones and Sarasota was officially memorialized by the Sarasota County Historical Society with the dedication of a bronze marker that stands at Bobby Jones Golf Club today. Perry Adair was an integral part of the “Golden Age of Golf.” He grew up in Georgia and loved the game, playing at the Atlanta Athletic Club’s East Lake Golf Course, mentored by selfless East Lake club pro Stewart Maiden, who brought with him from Carnoustie, Scotland the knowledge of what it was like to play for national championships. Perry's father George Adair was instrumental in Perry’s early career development and took the boy off to compete in tournaments where he had to face new conditions and adult competition. He thrived on it. Perry, two years older than fellow East Lake prodigy Bobby Jones, became a highly regarded amateur player. At 16, Perry lost to his good friend 14-year-old Bobby in the East Lake Invitational and in the Georgia Amateur 36-hole final. At 17, Adair was the 1914 East Lake Country Club Champion, then the 1921 and ‘23 Southern Amateur Champion and 1922 Georgia Amateur Champion. Among the fund-raising tours by professional and amateur golfers for the war effort in 1918, Adair toured the East Coast and the Midwest as part of the “The Dixie Whiz Kids”, playing in exhibition matches featuring fellow Atlanta teenagers Watts Gunn, Bobby Jones and Alexa Stirling, and Chicagoan Elaine Rosenthal, raising $150,000 for the Red Cross. While playing the Midwest, these famous teens were often joined by pros Chick Evans and Walter Hagen. Perry Adair was inducted into the Georgia Tech Hall of Fame in 1973, and into the Georgia Golf Hall of Fame in 2009. James Martin "Long Jim" Barnes' two PGA Championship titles were the first in the event; there was no tournament in 1917 or 1918 during World War I. Barnes won 21 times on the PGA Tour, won the 1925 British Open, in 1940 was one of twelve inducted to the PGA's inaugural Hall of Fame, and was inducted into the World Golf Hall of Fame in 1989. Barnes' winning margin of nine strokes in the 1921 U.S. Open set a record not broken until Tiger Woods won by 15 in 2000. Archibald Edward Wones "Archie" Compston defeated Walter Hagen in the 1928 British PGA Matchplay Championship, 18 & 17; held the third-round lead over Bobby Jones at the British Open at Hoylake in the 1930 Grand Slam campaign; and later became notable as perhaps Britain's first "celebrity" professional golfer, becoming coach to future King Edward VIII. Leo Harvey "Eagle" Diegel was selected for the first four Ryder Cup teams, won 30 times on the PGA Tour and seven other state Open titles, won the 1928 Canadian Open and PGA Championship and defended both successfully in 1929 while defeating Walter Hagen in matches each year, was British Open runner-up to Bobby Jones in the Grand Slam year of 1930. Diegel was runner-up in the 1926 PGA Championship, 1920 British Open Championship and finished 3rd in the 1929 British Open Championship and 1931 United States Open. Founder of the Tucson Open, Diegel is a World Golf Hall of Fame member. Bobby Jones and Leo Diegel. Photograph courtesy of the USGA. John Joseph "The Gentleman" Farrell won 22 times on the PGA Tour and five times elsewhere as a professional, won the 1928 U.S. Open by defeating Bobby Jones in a playoff, was voted the 1927 and 1928 Best Golf Professional in the United States, and played in the first three Ryder Cups. Watts Gunn, another "Dixie Whiz Kid", born Macon, Georgia in 1905, made golfing history in 1925 in the U.S. Amateur, setting the world record for international championship golf by winning 15 straight holes in the first round of the 36-hole match. In that tournament he went to the finals, losing to friend and rival Bobby Jones, marking the only time two players from the same city met for the U.S. Amateur crown. 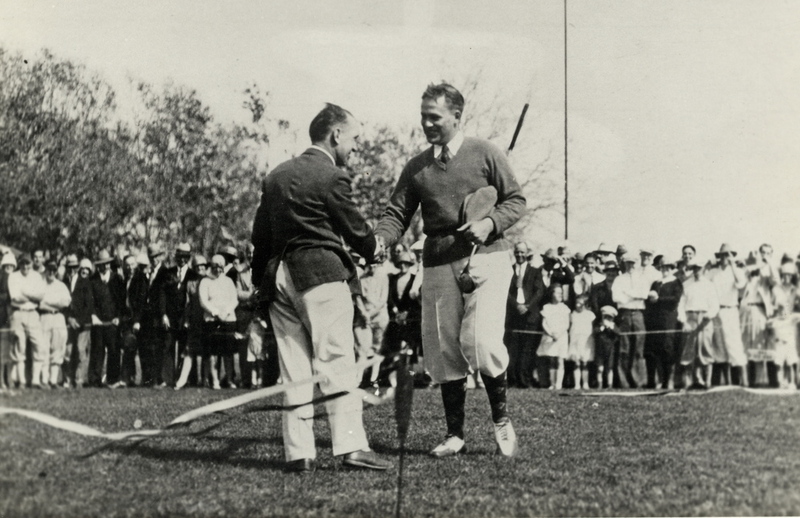 Watts Gunn congratulates Bobby Jones at the United States Amateur Championship at Oakmont Country Club in 1925. Jones defeated Gunn in the final, 8 & 7. In 1926 and '28, Gunn played on Walker Cup teams with Bobby Jones, defeating the team from Great Britain & Ireland both years. He won the Georgia State Amateur title in 1927 and '28, was 1927 National Intercollegiate Champion, and is a member of the Georgia and Southern Golf Association Golf Halls of Fame. "Sir" Walter Charles "The Haig" Hagen made his professional debut at age 19 at the 1912 Canadian Open, placing 11th. Hagen also excelled at baseball as a pitcher and shortstop. He cancelled a 1914 tryout for the Philadelphia Phillies in order to play in a golf tournament, and later that week was United States Open Champion. Hagen amassed a tally of eleven professional majors, third behind Jack Nicklaus (18) and Tiger Woods (14). He won the U.S. Open twice, and in 1922 became the first native-born American to win the British Open, which he won four times. Hagen won the PGA Championship a record-tying five times and the Western Open five times when it had near-major championship status. Hagen totalled 45 PGA Tour wins in a 75-title career, was a six-time Ryder Cup captain, is a charter-class Hall of Fame member, and may have been the first in any sport to earn a million dollars in his career. Arnaud Massy in 1906 won the first edition of the French Open played at a Paris course. In 1907 he repeated, defeating a strong contingent of British players including the great Harry Vardon, and then became the first non-Brit to win The British Open Championship. Serving in the French army in WWI, he was wounded at Verdun, and lost four years of his golf career. In 1925 at age 48, he won the French Open a fourth time and won back-to-back Spanish Opens in '27 and '28. Massy remains the only Frenchman to have won any of golf's majors and was the only golfer from Continental Europe to win a men's major championship before Seve Ballesteros won the 1979 British Open. Eugenio Saraceni, Gene "The Squire" Sarazen won 39 PGA tournaments, was the Associated Press Male Athlete of the Year in 1932, played on six U.S. Ryder Cup teams, won the PGA Tour's first Lifetime Achievement Award in 1996, and was ranked by Golf Digest in 2000 as the 11th greatest golfer of all time. Sarazen invented the modern sand wedge and debuted the club (while keeping it secret during preliminary practice rounds) at the British Open in 1932 (which he won). Sarazen famously hit "The shot heard 'round the world" to win the 1935 Masters Tournament after trailing by three shots. The winner's check had already been written to leader Craig Wood. Sarazen's double eagle remains one of the most famous shots in golf history. The Sarazen Bridge at Bobby Jones' Augusta National Golf Club was named to commemorate this feat. Competing in the 1973 Open Championship at Royal Troon Golf Club, Sarazen scored a hole-in-one at the "Postage Stamp" par three, at age 71. Sarazen was the first and remains one of only five golfers to win all four professional majors, the Career Grand Slam. Sarazen received the Bob Jones Award in 1992.